Grand Canyon is one of the greatest sceneries of our World. We have been nothing but spectators of this set, always staring from an external and safe position, being afraid of dealing with its overwhelming scale. The main goal is to make the human being and his architecture actors of this unique space. We do not compete with the Canyon, as the intervention is by all means transparent, but still connecting visitor and environment. Conceiving the Canyon as an infinite line, a series of stations are provided, granting the visitor the chance to explore and wander the park, each one in its own way. This device consists of a set of 4 Aluminium ribs, supporting a translucent fabric that adapts to the shape of the body and allows numerous configurations. These ribs get attached to a fixed but flexible anchored system repeated over the line of the Canyon. The light produced comes from sunlight. 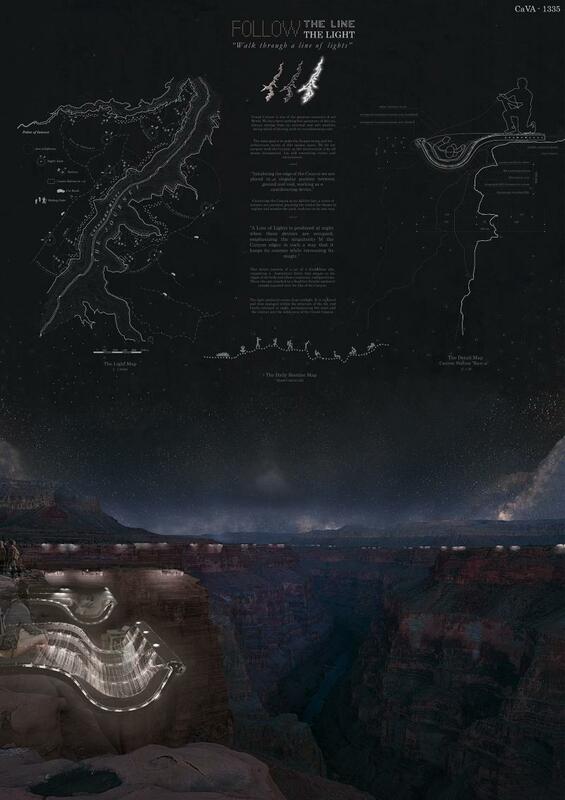 It is captated and then storaged within the structure of the rib, and finally released at night, accompanying the stars and the visitors into the wilderness of the Grand Canyon. Me parece fantástico. Sois geniales. Buenas noches, me gustaría contar con vosotros para el próximo proyecto de rehabilitación del canal de Suez. Si estáis interesados, escribidme. Parece alucinante, poder dormir en el aire y encima en el Gran Cañón! !